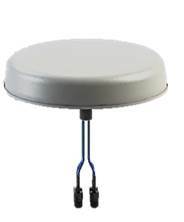 The Patent Pending CMX69273P is an indoor broadband Low PIM 2 port MIMO omnidirectional ceiling mount antenna. It is designed to provide pattern coverage that is optimized for indoor requirements at 698 to 960 MHz and 1690 to 2700 MHz frequency bands at each port. The individual antenna elements are designed to radiate a pattern that has been specifically shaped to provide optimal radiation within a coverage zone. - Complete cellular 3G/4G LTE data communication at each antenna port.<br/>- Low PIM performance minimizes interference and improves in building wireless network coverage and capacity.<br/>- Attractive, compact design and form factor ideal for indoor solution applications.